To get the best adhesive for your tile of choice and substrate, consult your tile dealer. 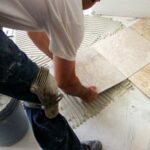 For installing ceramic or stone floor tile, latex-reinforced thinset mortar is usually the best choice. 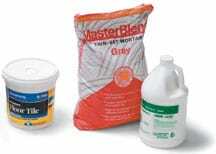 It comes in powdered form; you mix it in small batches on the job and must use it within about half an hour. Latex reinforcement adds strength and a bit of flexibility to the thinset; without it, the thinset can crack easily. Some thinset comes with a powdered latex in the mix; just add water. A second variety requires the addition of a liquid latex additive rather than water. This type is stronger. Epoxy thinset is an expensive adhesive with three parts that are mixed on the job. Use it in situations where extra sticking strength is needed. Two products on the market advertise themselves as work-saving innovations. The first, ready-mixed floor tile adhesive, is a premixed organic mastic that is said to save work and mess compared to thinset. Many homeowners have reported success with this product. Be aware, however, that it costs more and is not as strong as thinset mortar. 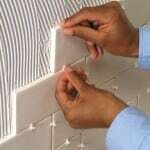 The second is an “all in one” product that acts as both adhesive and grout; the idea is that you can set the tiles and grout the joints in one fell swoop. 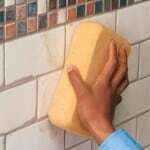 Unfortunately, using this material will leave you with grout lines that are more porous and difficult to clean than standard grout.